The automotive industry is one of the pioneers when it comes to exploiting optical silicones for lighting systems. In addition to this, LSR is also becoming increasingly important as a lens material for street and building lighting. Like the established thermoplastic lens materials PMMA and polycarbonate, silicone offers significant weight savings compared to glass. However, LSR is superior to organic polymers in terms of thermal and chemical resistance. Highly transparent grades for optical applications have a lower yellowing index than thermoplastic lens materials. They are extremely resistant to environmental influences such as UV radiation and can be used over a wide temperature range from -40 to +200 °C. In addition, they allow particularly flexible design. In terms of the geometry, there are almost no limits when processing LSR in injection moulding. During the four days of the fair, Engel will be processing Dowsil MS-1002 Moldable Silicone by Dow Silicones (Wiesbaden, Germany), a material developed specifically for use on injection moulding machines. The curing speed has been optimised to obtain a smooth and very hard surface similar to thermoplastic. The high light transmission ensures a very good luminous efficiency. In addition, the high thermal stability enables an outstanding transparency. The surface, with its extremely filigree structure, is moulded with highest reproducibility. The LED lenses leaving the production cell are ready for installation. With their filigree structure, LED lenses place extremely high demands on the injection moulding process. The trend is towards LSR lenses. "The prerequisites for economically producing geometrically demanding products from liquid silicone are automated, rework-free processes as well as high precision and stability of the injection moulding process," as Gero Willmeroth, the President East Asia and Oceania of Engel, based in Shanghai, emphasises. "Thanks to its tie-bar-less clamping unit, the e-victory machine with an electric injection unit is predestined for this." Tie-bar-less injection moulding machines offer a number of advantages for processing LSR. The fact that the robot can reach the cavities directly from the side without having to circumvent any obstacles reduces the handling time, and therefore the mould opening time. On top of this, the tie-bar-less technology allows for particularly compact production cells. Because there are no tie bars in the way, the mould mounting platens can be fully used up to their very edges. This means that the high-volume lens mould necessitated by the complex component structure fits on a comparatively small 120 ton injection moulding machine. One of the reasons for the accurate reproduction of surface detail is the outstanding parallelism of the mould mounting platens. The patented force divider ensures that the moving mould mounting platen follows the mould precisely while clamping force is building up and that the force introduced is evenly distributed across the platen surface. When multi-cavity moulds are used, the parting lines of all cavities experience the same surface pressure. This prevents flash when processing very low-viscosity silicones, and avoids reworking of the injection moulded parts. 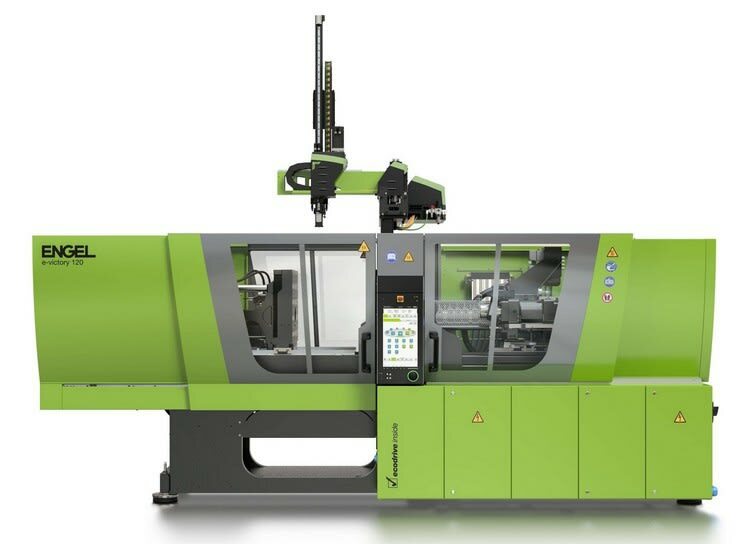 With its tie-bar-less clamping unit, the Engel e-victory injection moulding machine allows for compact production cells, particularly efficient automation, and a consistently high product quality. 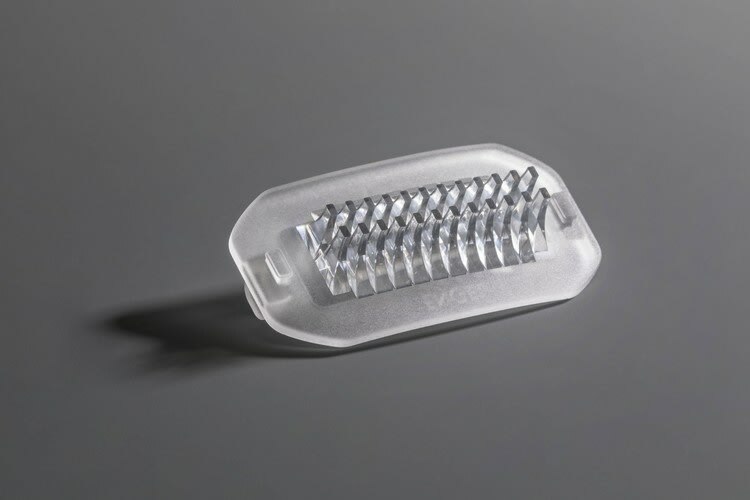 Engel has equipped the e-victory with iQ weight control for the manufacture of the LED lenses to ensure the required precision during injection throughout the entire manufacturing process. The intelligent assistance system from Engel's inject 4.0 program analyses the pressure profile during injection of the polymer melt, compares the measured values with a reference cycle and adjusts the injection profile, the change-over point and holding pressure shot by shot to the current conditions. Fluctuations in the raw material and ambient conditions are automatically compensated before even a single reject moulding is produced. The camera system integrated in the process checks and documents the quality of the parts. An Engel viper 40 linear robot is used for parts handling. The iQ weight control intelligent assistance system compensates for fluctuations in the raw material and ambient conditions before rejects are produced. As a system supplier, Engel integrates all of the production cell components in a single control to be able to set up and control the entire process via the injection moulding machine's CC300 control panel. In addition to automation, control integration also includes the LSR metering equipment, which, like the mould, comes from ACH-Solution (Fischlham, Austria), as well as an augmented reality (AR) solution, which Engel is implementing together with AVR Tech Innovations, also from Fischlham, Austria. Trade fair visitors can be guided through the individual work steps required to start the production cell with AR (Augmented Reality) glasses. In the form of texts, animated objects or short video sequences, the glasses display helpful information on system operations, precisely describing what needs to be done, where and how. 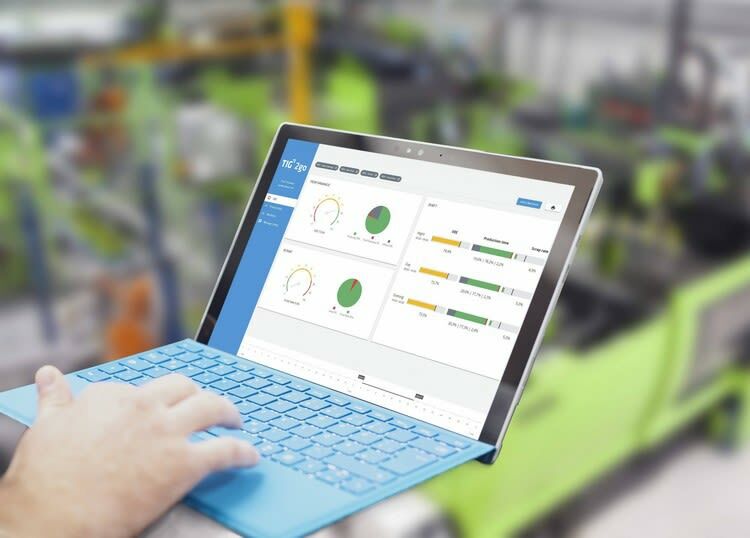 In the injection moulding plant of the future, augmented reality can support machine setters and maintenance personnel with the aim of working even more efficiently and reducing the risk of errors in operation. During the manufacture of LED lenses, Engel uses the iQ weight control assistance to ensure permanent adaptation of quality-relevant process parameters based on real time data, which is an essential feature of the smart factory, and at the same time the objective of Industry 4.0. The increasing integration of expert knowledge into process control helps to reduce the complexity of processes. 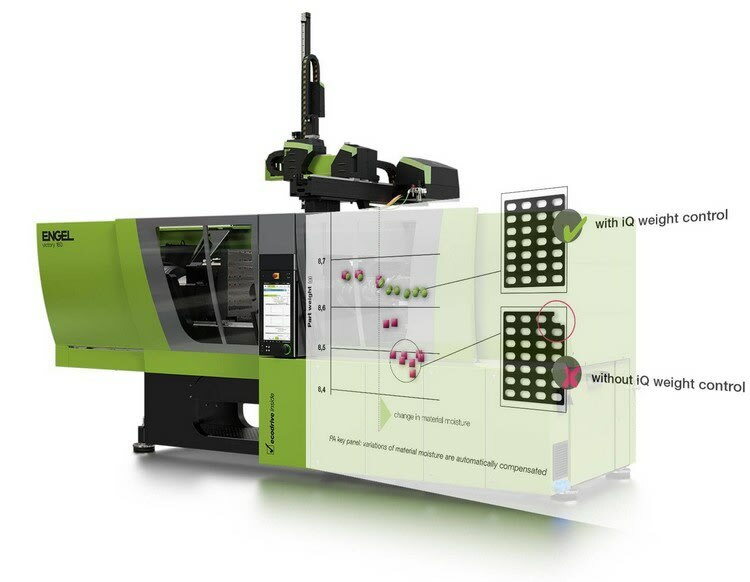 "Thanks to the self-optimising injection moulding machine we make it particularly simple for processors to leverage the full efficiency and quality potential," says Gero Willmeroth. "Even semi-skilled employees who do not yet have much injection moulding experience are able to produce a consistently high quality." Other assistance systems that Engel will be presenting in Expert Corners during the fair include iQ clamp control for automatic determination and adjustment of the optimum clamping force, and iQ flow control for dynamically controlled multiple-circuit temperature control. One special highlight in the Engel Expert Corners is the Engel customer portal e-connect, which will be presented in the Chinese language at Chinaplas. At any time and anywhere, it provides an overview of the machine status, the processing status of service and support orders and the prices and availability of spare parts. In this way, the portal simplifies and accelerates communications between processors and Engel. 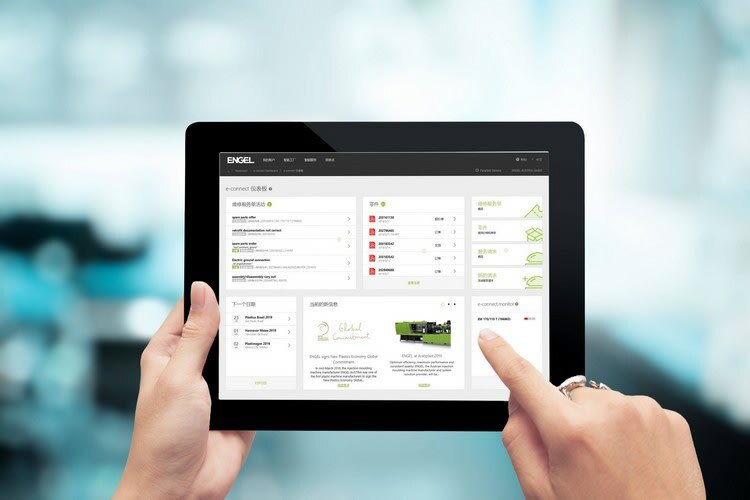 All service products from Engel's inject 4.0 program are integrated into e-connect, including the new e connect.monitor for condition-based predictive maintenance and e-connect.24 for 24/7 online support. The new Engel customer portal e-connect will be presented in the Chinese language at Chinaplas. In Guangzhou, Engel will also be presenting TIG authentig for linking injection moulding machines and production cells. The MES (Manufacturing Execution System) by Engel subsidiary TIG (Rankweil, Austria) is tailored to the specific requirements of the injection moulding industry down to the last detail. It ensures transparency in order to, for example, utilise the capacity of the machine park or correlate productivity indicators and economic objectives. The new products that TIG will be presenting in China include the TIG 2go dashboard solution, which is particularly suitable for entering the MES world, and the TIG big data high-performance analysis platform for networking machinery around the globe in a central cockpit.